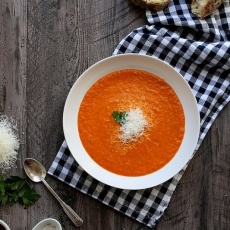 Creamy warm soup with a hint of sweetness and a comforting earthiness. It’s a lovely transition into the cooler weather that we’re hoping for. Place rack in the upper third of the oven and preheat oven to 400 degree F.
Place whole red bell peppers in a 9x13-inch dish. Drizzle with 2 tablespoons olive oil and rotate to lightly coat each pepper in oil. Roast for 15 minutes until blackened on the top. Remove from the oven and flip each pepper. Roast for another 15 minutes until the other side is also softened and blackened. Remove from the oven and immediately cover pan in foil. Allow to steam for 10 minutes. Uncover and let the peppers rest until cool enough to handle. When cool enough to handle, remove the stem and all of the seeds and the charred red pepper skin. Discard. To make the soup, place a large pot over medium heat. Add the remaining olive oil. Add the onions and garlic and cook until the onions are softened and translucent, about 5 minutes. Add the carrots, celery, and parsley. Cook for 3 minutes more. Add the cumin, garam masala, and bay leaf. Stir to combine. Add the roasted peppers. Add the stock, turn the heat to low, place a lid on the pot and simmer for 20 minutes or until the carrots and celery are softened through. Remove the pan from the heat and use an immersion blender to blend the soup mixture smooth. Alternately, you can blend the soup in three batches in an upright blender. Just be not to fill the blender too full and to keep the lid on tight. Stir in heavy cream and season with salt and pepper to taste. Soup will last in an airtight container in the refrigerator for up to 7 days. This soup also freezes well!